Create a Standard competition to compete on no specific goal to reach other than being the best. In the competition creation wizard, click on Standard. In the second step of the wizard, you'll be asked to pick a layout for the competition. A layout is the theme of the competition as it's displayed on the TV-monitors. Proceed by clicking the rightmost arrow at the bottom of the wizard. In the third step of the wizard, you'll choose the type of participants. 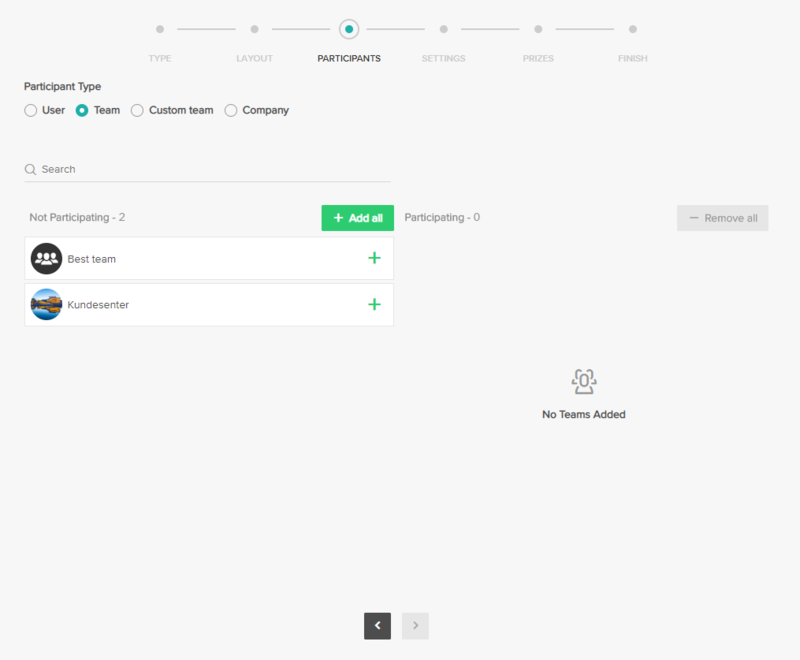 You can decide if Teams should compete against one another, or Companies should, if the SalesScreen subscription consists of a multiple-company structure. You can also even create Custom Teams that will only exist in the context of the competition. This is easier understood through an example; if John is on Team-A and Beatrice is on Team-B, you can set up a competition where John and Beatrice are placed on the same team (e.g., Team-Awesome). Team-Awesome will exist as long as the competition is running, where team members are working towards a commong goal set by the bounds of the competition. 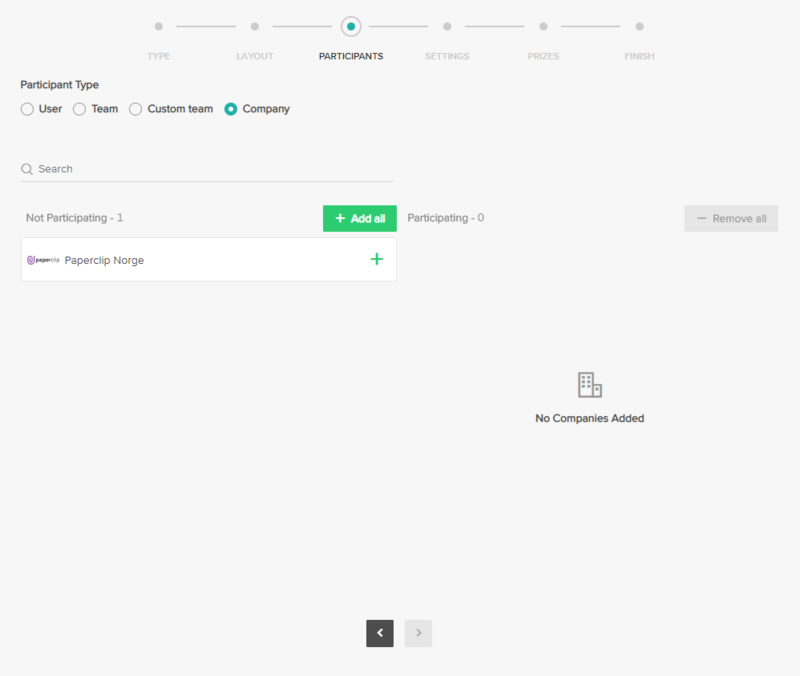 If available, you can enable the Executive switch, which lets you pit users, across all companies in your multi-company structure, against each other. 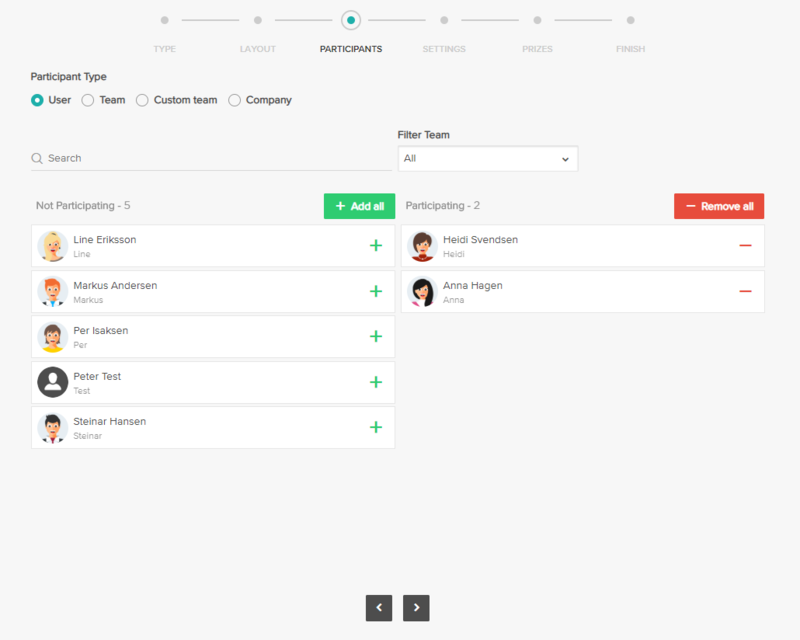 This feature also enables you to pit teams across all the companies against each other - or the companies themselves, against one another. Custom teams are also supported, where you can create teams for the competition - with members from across all the companies. In the third step of the wizard, you'll choose the type of participants. 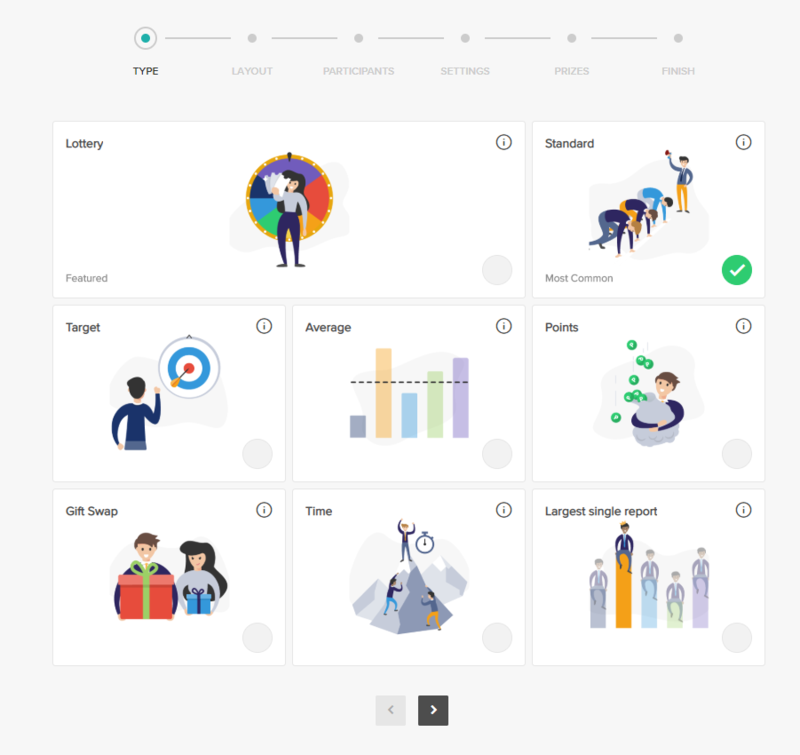 You can decide if Users should compete against one another, or if Teams should - or even Companies, if the SalesScreen subscription consists of a multiple-company structure. Select participants from users across all teams. This enables you to set up a competition between all users in the company, or between a specific subset of users. Select participating teams from the company. You can choose all teams or a subset of teams. Select participating companies from the list of companies on the left. Create a custom team by clicking on Create Team. 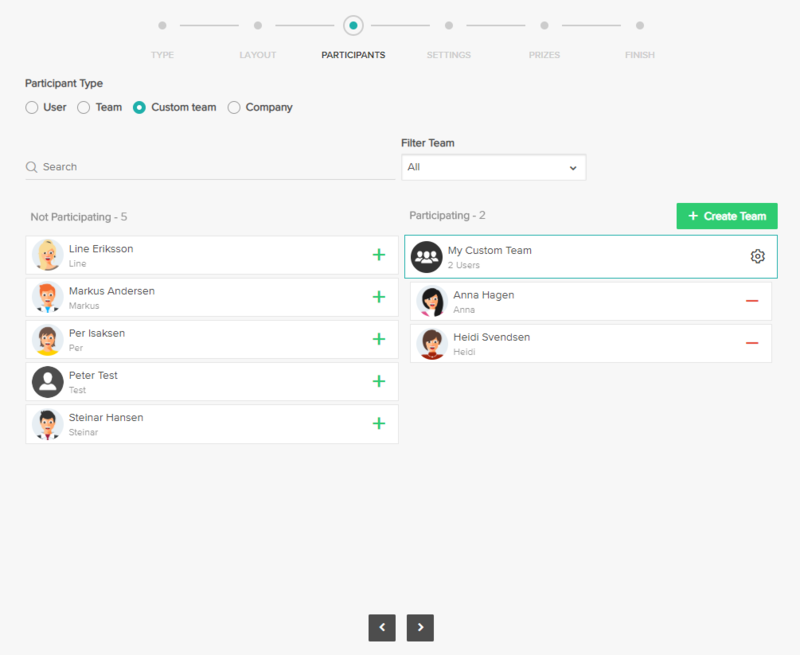 Add a name to your custom team and start adding users by clicking on the users on the left side. Repeat the process until you have all the custom teams you need. In the fifth step of the wizard, you'll define key settings of the competition - i.e. name, due date, report type etc. The following are short descriptions of the different settings. Set the title of the competition. 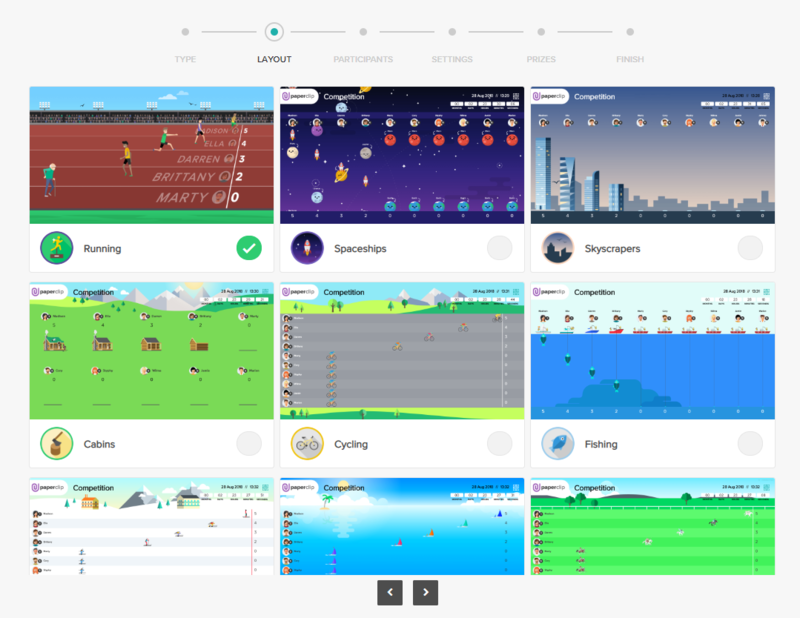 In the example above, the title is set to "Budget race!". The Title field helps to identify the competition slide that can be placed in playlists, which are displayed on TV-screens. This field is handy when wanting to provide the competition with a short description. The Description field helps to identify the competition slide that can be placed in playlists, which are displayed on TV-screens. Set the start date and end date of the competition. All relevant reports made by users after the Start Date and before the End Date, will count in the competition. Select what report type is relevant to the competition. Reports can be of type Sales, Activities,Offers or Meetings. In the example above, the competition will compete on Sales. This means that only sale reports will count in this competition. 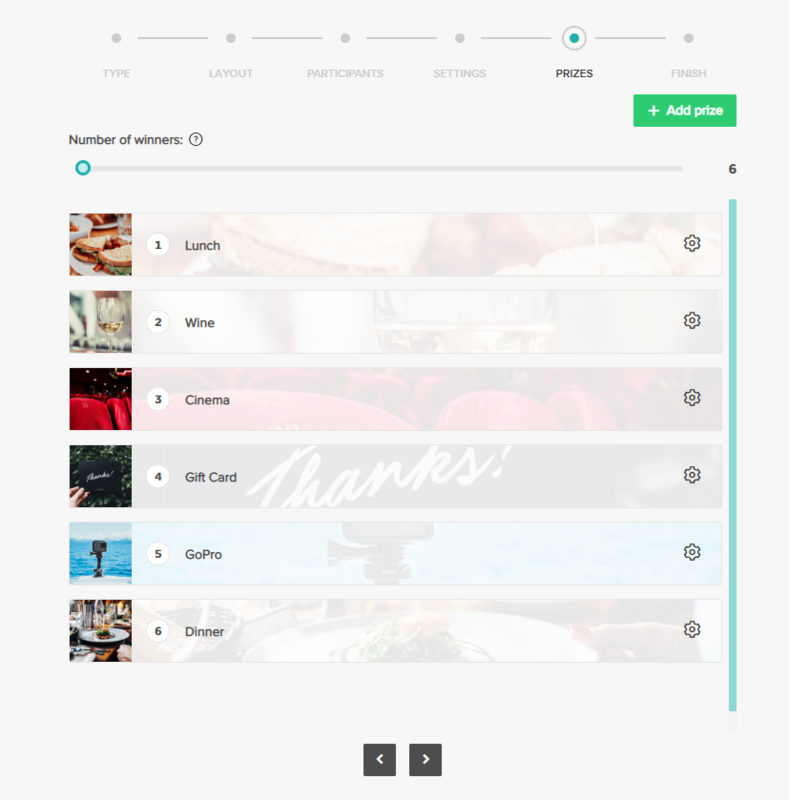 Select what products are relevant to the competition. The set of available products depends on what you compete on. Only reports, with the products included in this field, will count in the competition. Select what unit the competition should consider. If Value is chosen, the competition will be based on the Value (amount) of relevant reports. If Quantity is chosen, the competition will be based on the quantity (numbers sold) of relevant reports. Select the function of which SalesScreen will choose the winner(s) of the competition. If Goal is reached is chosen, the competition will only define the participant(s), that actually reached the budget/quota before the competition's end date, as winners. If Time is over is chosen, the competition will define the participant(s), who are leading at the moment when the competition ends, as winners. Select how many participants should be visible on the competition slide (at TV-screens) at the same time. The number can vary from 1 to 15. Simply use the slider to set the number. In the example above, the number is set to 10. Select the privacy level of what is going to be displayed on the competition slide. If Show value only is selected, only the participant's values (amount or quantity) is displayed. If Show progression only is selected, only the participant's budget progression percentage is displayed. 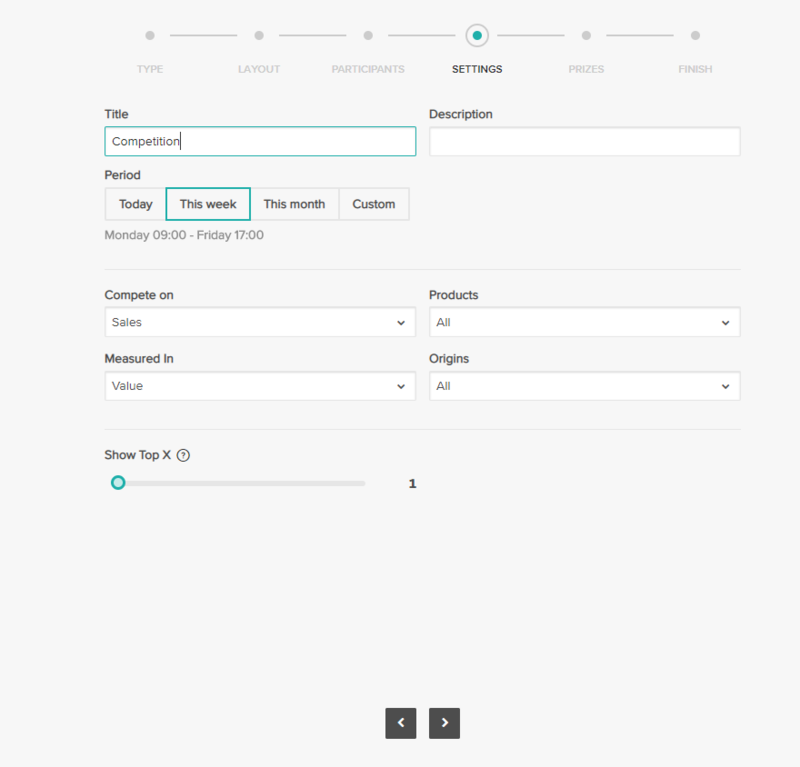 If Show everything is selected, both the value and the budget progression is displayed. In the fifth step of the wizard, you can define prize(s) that will be awarded the winner(s) of the competition. You can choose to have no prize at all or even multiple prizes. As seen at the top of the wizard, the Number of winners field decide how many participants can become winners of the competition. For instance, if you choose to have two winners for the competition, the first place winner can get one prize and the second place winner can receive another. Or, they can both receive the same prize. Name: Set the name of the prize. This field help to identify the prize later. Description (Optional): Set the description of the prize. This field help to identify the prize later. Image (Optional): You can upload a prize image. 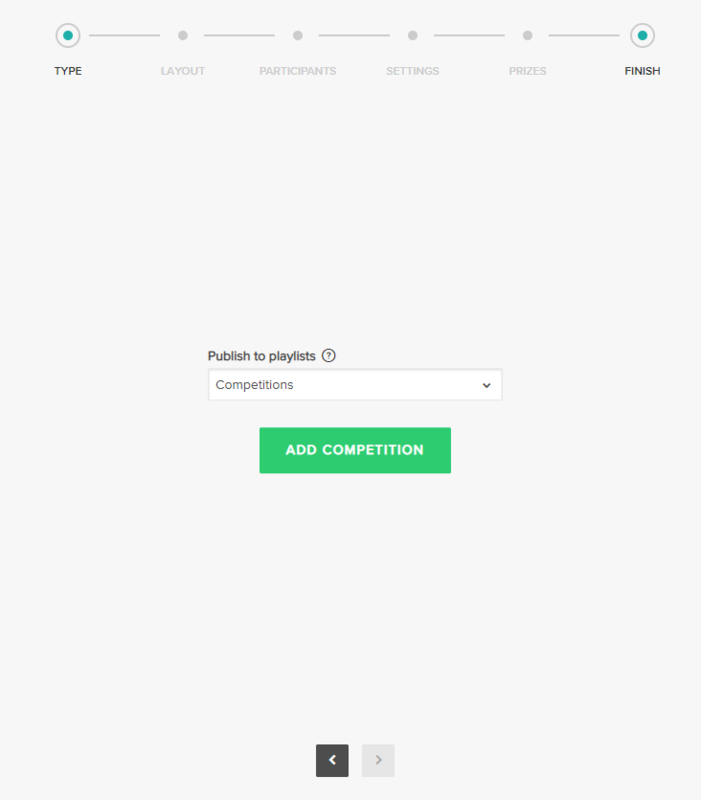 In the last step of the wizard you can choose none or multiple playlists to publish the competition slide to. This shortcut exists so that you don't have to assign the competition slide to your different playlists.